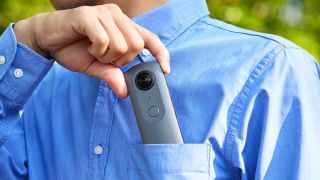 Ricoh Imaging has announced a new flagship model in its Theta series of 360-degree cameras, the Theta V.
The Theta V allows users to capture 360-degree spherical still images and 4K 360° videos, and makes use of a brand new image sensor. This, the company claims, delivers significant improvements to both stills and video capture over previous models. Furthermore, thanks in part to developments made for Ricoh's GR models and Pentax-branded DSLRs, the camera is also said to see improvements with regards to both exposures and white balance. Ricoh Imaging claims that power consumption has been reduced next to previous models, with high-speed shot image data readout from the sensor. This works in partnership with a Qualcomm Snapdragon processor, which was rumoured to make an appearance here, with processing speeds now 2.5 times faster too. Users are able to output stills at an approximate resolution of 14MP, and can post 360-degree spherical images directly to Facebook and other platforms supporting the feature. 4K 360-degree videos, meanwhile, are captured at 30fps at a 3840x1920-pixel resolution, with real-time live streaming of 4K 360-degree videos also possible. Audio quality is also said to have moved on from before, with a built-in, four-channel microphone supporting 360-degree spatial audio recording. With this, the user is able to capture omnidirectional audio both horizontally and vertically, although a separate TA-1 3D Microphone (pictured below) will also be made available for the benefit of those needing to pick up audio across a particularly broad range of frequencies. Other features include shutter speeds up to 1/25,000sec, a top sensitivity of ISO 3200 for stills and 19GB of on-board memory, together with both Wi-Fi and Bluetooth Low Energy to allow the camera to be paired with a smartphone or tablet. The Ricoh Theta V will go on sale at the end of September, with an RRP of £399.99/$429.95. Two optional accessories will also be available for the new camera. The aforementioned TA-1 3D Microphone will be available at the end of September at an RRP of £249.99, while the TW-1 Underwater Housing will arrive a month laster, priced at £179.99.